The old saying “time flies when you’re having fun” is so true of late. This year started with a bang and I feel like I’ve been running ever since. 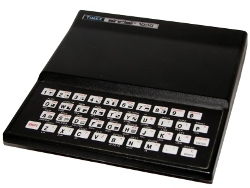 It isn’t that I haven’t wanted to work on my old ZX81 programs, but they often take a back burner to other past times. That said, I did find some time to sit down this weekend to type in another program. For February I present you with ENLARGER. If you hadn’t noticed, most of the programs I post are of the game variety. I wanted to post something different. Although I have presented other graphic programs in the past, this one is a bit different in that it is really about the function and not the form. ENLARGER is a simple program that takes a picture and makes it bigger. In this case I chose a simple moon to enlarge. Although the function works, it isn’t very practical due to the speed. Because of this I did update the program as ENLARGER+ (listing). This version simply saves each frame and loops through them in a real-time display. The program is actually straight forward and simple. All of the logic is in lines 130 through 220. The program loops through the first 15 or so lines of the program and enlarges it by four. 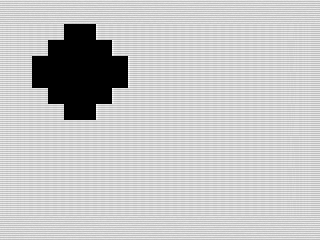 Clipping is rudimentary since the dimensions of the screen are fixed. In effect you take an entry from one array and represent its larger version in a new one. That new array becomes the next frame in the animation. ENLARGER+ simply saves each frame in another array to replay later without having to redo the calculations. Although a rather brute force way of doing things, it works. In any case, ENLARGER is a fun little program that shows that simple things often have simple solutions. I almost wish I’d kept working on it though, perhaps trying other images or using plot or trying other transformations. Although I guess it wouldn’t be so simple then. If you want to run this program on your Android phone or tablet you can download a compressed copy of ENLARGER to your device. You'll need to save the .p version of the program to your device to allow Zed Ex (Beta) to run it. You can also download a compressed copy of ENLARGER+.